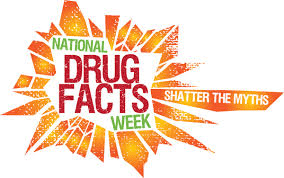 January 27 to February 2 is National Drug Facts Week. This drug education and prevention week was launched by the National Institute on Drug Abuse (NIDA) in 2010. One week each year, the NIDA dedicates that time to educate teens and their families about drug use and abuse, explore prevention methods and to shatter the myths about drugs and drug abuse that teens are hearing everyday while in school or through the media. Across the country, the NIDA will create and hold community events where teens will come together with drug abuse experts and begin an open dialogue and have honest conversations about drugs, the consequences of drug use and abuse and how drugs affect the mind and the body. Many of the events will be held at school assemblies, after school clubs, athletic events and other community venues. Substance abuse, chemical dependency and drug and alcohol abuse among teens is an issue that many schools and families face, often in alarmingly regularity and more often than in the past. The dangers of new, harder drugs has made the need for this type of drug abuse education and prevention event even more prevalent in the minds of educators, families and health and drug addiction treatment providers. The NIDA’s National Drug Facts Week is a health observance week aimed at teens and uses community-based events and activities, local and national exposure through the web and television to encourage teens to get factual information and answers from scientific and medical experts about drugs and drug abuse. New Youth Culture Tour Concert. Hard driving rock band of recovering folks with all original music and clear messages. Free to middle and high school aged people. Displays of student’s creative work and dance at the annual dance concert. Art exhibit featuring works by teen members of On the Mark Adolescent Activity Center. The mission of On the Mark is to provide a safe, community-based adolescent clubhouse/sober activities center with developmentally appropriate services grounded in a peer-based support system. This exhibit will be on display from January 27 through February 28, 2014. Displays with information about drug abuse among college students will be placed in multiple locations on campus. Information on where to go for help and different drug abuse treatment services will also be provided.